Technology innovation today is coming from mobile computing and the cloud. Consumers are demanding more responsive mobile devices with longer battery life, while system reliability and electricity costs are shifting the focus to performance/power optimization in the cloud. MIPI® serial technologies have been developed to optimize both performance and power consumption, driving adoption by silicon chipset vendors and mobile device and cloud server manufacturers. MIPI M-PHY, a 6-12 gigabit per second (gb/s) electrical physical layer standard, has been chosen as the PHY layer for Universal Flash Storage (UFS). Other consortiums are adapting their technologies to M-PHY too, including the PCI SIG and USB-IF. Vendors are implementing MIPI M-PHY for memory applications using UFS, as a universal bus using UniPro, and for camera, display and RF applications using CSI, DigRF and LLI. 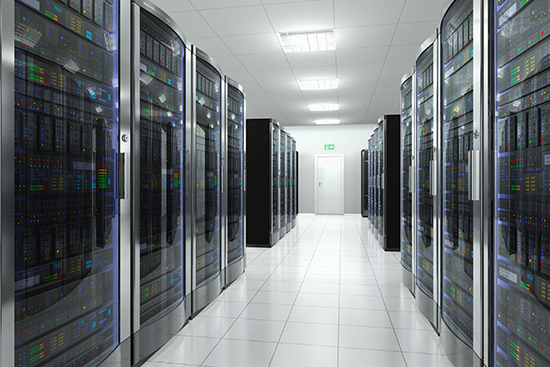 Cloud server vendors are evaluating M-PCIe and SSIC as possible low power buses in place of existing technologies. As developers implement MIPI serial technologies, a new set of design, debug and test challenges present themselves. Developers need to equip themselves with new tools capability of testing MIPI serial buses effectively, to shorten time to market and reduce the cost of the debug phase in product development. 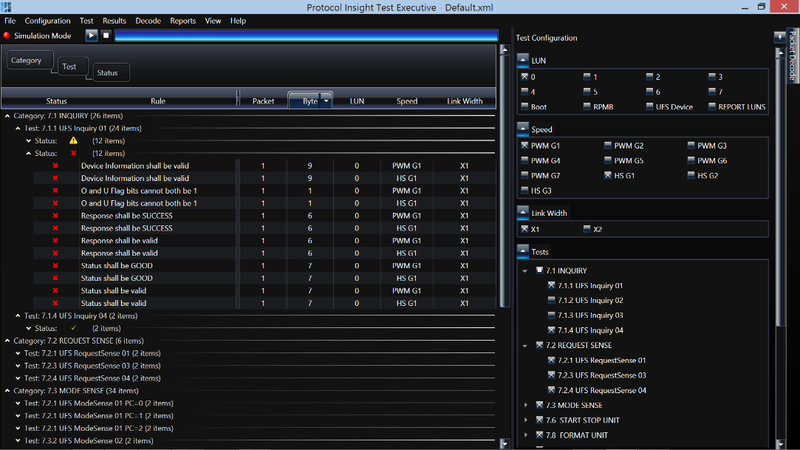 As described below, Protocol Insight offers MIPI compliance test capability, and serial protocol and MIPI design consulting services for mobile design and debug. Compliance or conformance testing is recommended or indicated for Host-Device interoperability verification of silicon and end-products. Common applications include initial device turn-on debug, system integration debug, inter-op workshop preparation, and compliance or conformance certification. Protocol Insight’s Test Executive and Falcon G350/G450 Exerciser products perform conformance/compliance testing of UFS, UniPro and Greybus. Test Executive offers complete test coverage and analysis of the UFS, UniPro and Greybus standards. It performs Pass/Fail testing and provides insight into failure condition. 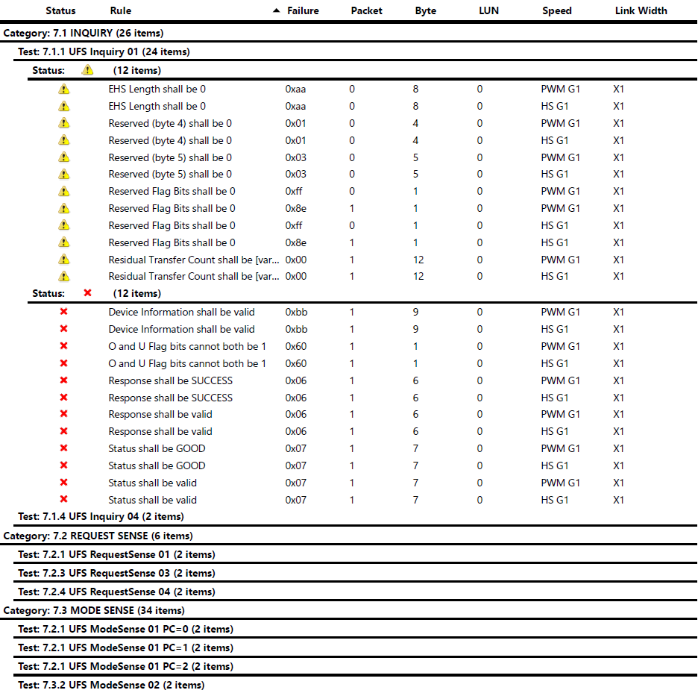 This will result in a shorter debug cycle and requires less knowledge of the JESD220, MIPI M-PHY UniPro or Greybus specifications on the part of the compliance team. The Falcon G350 and G450 offer UFS and UniPro protocol exerciser and analyzer capability for MIPI M-PHY HS-G3 and HS-G4 respectively. The G350/G450 products incorporate the UFS compliance and UniPro conformance testing capabilities of Test Executive. 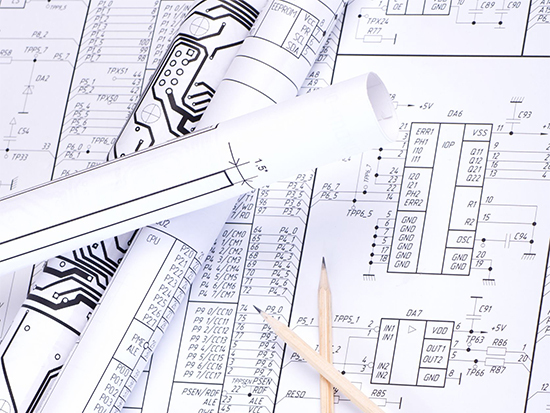 Protocol Insight offers system architecture, integration and digital logic design services and consulting for serial protocol designs.